Peyton Manning to Denver Broncos: The surprising, logical decision to dump Tim Tebow for an all-time great quarterback. 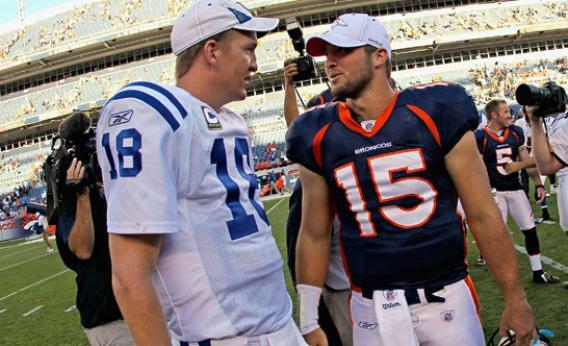 The Denver Broncos’ surprising, logical decision to dump Tim Tebow for Peyton Manning. Peyton Manning is the NFL’s least-mysterious superstar. Before each play, he cracks open his skull and shows off his brain, directing his teammates by flapping his arms and shouting things like “Louisville Soul Train.” After the snap, he picks out a receiver and hits him in the hands. By externalizing his internal deliberations, Manning lays football’s complexities bare. And by making passing and catching look so simple, he demonstrates that preparation and talent usually win out (unless the offensive line has some problems with protection). When you watch Tim Tebow, you have no idea what he’s thinking, what he’s doing, why he’s doing it, who he’s aiming at, whether it’s really possible for a ball to wobble like that, and—on certain, gilt-edged weekends—how his team is winning. Last season, Tebow led the Broncos to six straight regular-season victories and a playoff win over the Steelers without demonstrating that he knew what he was doing. For this, he was loathed by football rationalists and beloved by an army of blue-and-orange magical thinkers. If Monday’s reports prove correct and the Broncos dump Tebow for Manning, it will reveal that NFL front offices can stomach a certain kind of uncertainty. It’s a risk to stake your franchise to a soon-to-be 36-year-old quarterback who just missed an entire season with a bum neck. But this is a risk that football teams understand. Every great player has to deal with injuries and every great player gets old. In the best case, a star—like the Broncos’ John Elway, now the Broncos’ vice president of football operations—grabs a ring or two as he slides downhill to the Hall of Fame. In the worst case, he ends up like Brett Favre, his victory lap undone by a torn biceps tendon and a fouled-up shoulder. For an executive like Elway, it’s more sensible to put your faith in a genuine football hero than to give yourself over to a force you don’t comprehend. Tebow is younger and healthier than Manning and could have led the Broncos for the next dozen years. And in that alternative timeline, where would the Broncos have ended up? The answer lies somewhere within the range of a typical Tebow throw: Put on a blindfold, spin around 15 times, and cross your fingers that the resulting heave lands in a spot where Demaryius Thomas can snag it for an 80-yard touchdown. The Broncos’ decision to dump the risky young guy in favor of the risky old guy is totally logical, but decisions based on logic still have the capacity to shock in the NFL. This is a league in which risk-averse, embarrassment-conscious coaches enthusiastically reduce their chances of winning by refusing to go for it on fourth down. When Bill Belichick and Mike Smith flouted the prevailing superstition, they were criticized for their teams’ micro failures rather than praised for making the correct call under stressful circumstances. A successful play or game or season, by contrast, doesn’t typically invite as much scrutiny—when you get the result you want, nobody’s going to complain that the path to victory wasn’t smoother. But when one of the game’s best quarterbacks hits the open market, it’s harder to stay willfully blind to a winning team’s faults. In a typical offseason, Alex Smith would have secured a contract extension for leading the San Francisco 49ers to the NFC title game. This year, the 49ers—possessors of a hellacious defense and a passable offense—tried to dump Smith for football’s gesticulating genius. “This is the NFL. I guess nothing surprises me anymore,” Smith told the South Florida Sun-Sentinel, lying about his lack of astonishment. After getting tossed aside by the 49ers, Smith might now sign with the Miami Dolphins. Miami could also be a trade destination for Tebow, though Jacksonville—a short drive from the Heisman winner’s college home in Gainesville, Fla.—is the presumptive favorite to acquire him. For the Jaguars, success is measured differently than for a bedrock NFL franchise like the Broncos. With the team shriveling due to lack of local support, a fan-enthusing marketing dervish would fill an existential, franchise-sustaining need in Jacksonville. In a city accustomed to winning, though, Super Bowl heroism is the only kind there is. If Tebow miraculously won the Lombardi trophy in Denver, he would’ve been bigger than Elway. If Peyton Manning wins a title, it won’t be a miracle, and he’ll be the same great quarterback we know he is today. For an NFL team, that sounds like a guy to build your team around.